Brainless Beauty: While Brittany qualifies, she has nothing on Tiffany. Subverted with Quinn, who (until Is It Fall Yet?) worked at being 'not smart'. 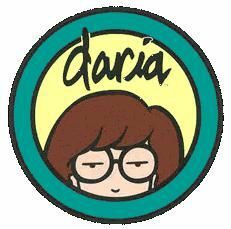 Inverted with Daria, who deliberately keeps her appearance plain (and is noticed immediately for her looks whenever she makes any change - "Quinn The Brain" and "Through A Lens, Darkly" are the go-to episodes for this inversion). Although Jane's mother is once seen in a PoV shot, from the waist down, answering a phone call from Jane. She is barefoot with her feet up, there is a haze of cigarette smoke, and incidental detail shows she is also an artist. As this is a PoV shot, her face remains hidden. Massive-Numbered Siblings: The Lanes barely qualify for this trope with five (Summer, Wind, Penny, Trent and Jane). Small Name, Big Ego: Ms. Li is self-aggrandizing, dishonest, callous, cares only about improving her image, is often foolish, and treats students like livestock. Naturally, she believes herself to be a wonderful principal. Not to mention Upchuck, who thinks he's God's gift to women. Talking to Himself : Marc Thompson voices several recurring characters : Mr O'Neill, Mr Demartino, Kevin, and Jamie. Wendy Hoopes voices major characters Jane, Quinn, and Helen. Taken to a new level in Daria! (the musical episode), where she sings a duet with herself.